Part of the grove with the trees in question. 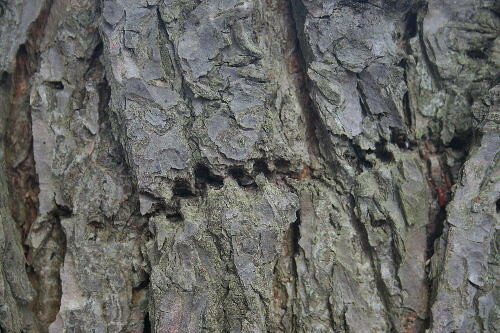 The four trunks on the right were peppered with holes, while the two on the left had none. I finished the post, posted it, and thought little more about it. A single trunk, showing the extent of the holes. From the thin twiggy branch that comes off the trunk to the left, near the top, all the way down to just above Raven's head... so thick with holes, I don't think there was anywhere where two vertical inches remained hole-free. Then a couple of weeks ago I got a Flickrmail from someone who’d been trying to find photos of the emergence holes of Hemlock Borers. She wrote to say she kept being directed to my post and Flickr photos, but that she wasn’t entirely sure that I had them ID’d correctly – to her, the straight lines seemed more like the work of sapsuckers. So I went back to my post, had another look, and then wrote her back to politely disagree. I didn’t know what they actually were, perhaps, but I felt confident they weren’t the work of sapsuckers. Second was the diameter of the trees. Again, my experience has been that sapsuckers tend to target smaller-diameter trees, usually no more than 6 to 8 inches DBH, though this doesn’t necessarily mean all sapsuckers will do this. But all of the trees showing this sign were at least a foot in diameter. 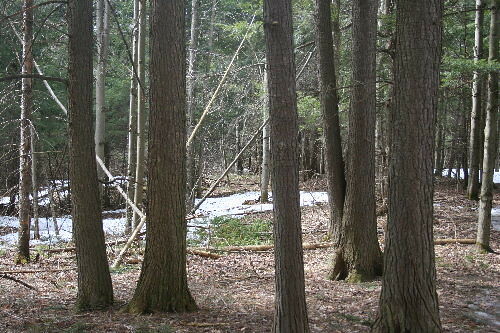 Third was the fact that there were SO many holes on each tree, and that every hemlock within this grove had such an excess but none of the surrounding trees showed any signs of damage. 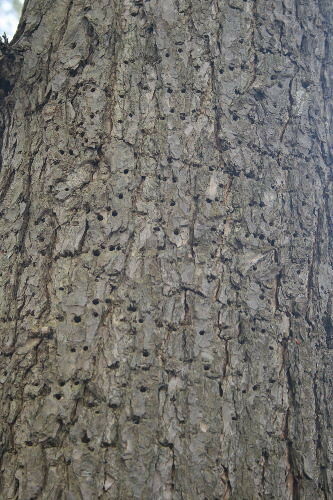 I’ve seen worked-over sapsucker trees before, but they typically have a favourite tree or two, not a whole grove of them, and the holes are concentrated in an area of a few or several feet, not as extensive as these were. I would consider it unusual for the lines to be so separated from each other. Many of the holes were in straight rows, like this. At the end of the post, I’d closed with the comment that I was looking forward to the publication of Tracks & Sign of Insects by Charley Eiseman and Noah Charney. It wasn’t out yet at the time. But now it is, and I have a copy on my shelf! So before I hit send to fire off the email back to her, I thought I’d have a browse through to look for photos of borer holes or other possibilities. Well, there wasn’t anything in there that looked right. Not giving up, though, I decided I’d go straight to the source, and contact Charley Eiseman himself. He’s helped me out with puzzling identifications in the past, and I thought he might be willing and able to shed some light on this strange sign. I said I’d get back to her once I got a reply from him. But there were quite a lot of them that appeared pretty random, too. I don’t have experience with that species, but here are my thoughts: The holes in the third photo are what I think of as classic sapsucker holes. 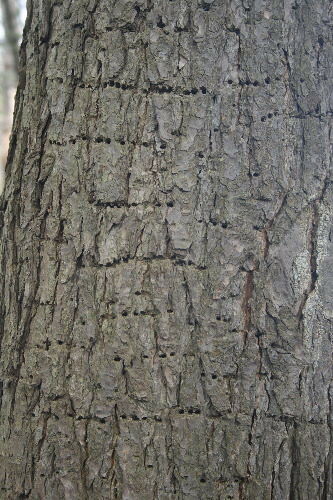 In certain tree species sapsuckers make vertical stacks of rectangular-ish holes, but in most cases (from what I’ve seen in New England–and Mark Elbroch agrees, in his “Bird Tracks & Sign” book, which I used as a model for my own book) they make neat horizontal rows of circular holes, just like that. I’ve watched sapsuckers visit these rows and sip from all the holes in a line, one at a time (in one case taking turns with a hummingbird, which was really neat to see). I also feel comfortable calling the holes in the last photo the work of sapsuckers, albeit slightly sloppier ones. The first photo I’m not sure about, but they seem to be similarly round holes, and the exit holes of a buprestid should be distinctly flattened. It also would be very unusual to see buprestids occurring in that density–I don’t think even an emerald ash borer infestation would look quite like that. I have seen holes like this in hemlocks that seemed to be beetle holes, but I’ve never figured out who makes them, although my first guess would be a scolytine bark beetle of some sort. I’ll let you know if I find anything out about them, and I hope you’ll do the same! And all of them were old. Some of them were beginning to lose their shape. Instead of clarifying the situation, Charley’s comments only served to muddy the water. I knew that they weren’t sapsucker holes, and he didn’t know what they were but didn’t think they were beetle holes, either. So I resolved that, next time I made it back to the woods, I’d return to the grove of trees and have another look. Which I did, a couple of days ago. I ran off a whole bunch of photos, counted the trunks that had been affected, examined the holes, posed Raven for scale, looked at the trunks from the other side, checked out the neighbouring, unaffected trees, came back and puzzled over them some more. And then my camera battery died, just as I went to take the photo of what I noticed that clinched the ID. What spectacular timing, I thought. I stood there and glared at it for a minute or so while I debated whether I should just post the topic with what I had, or defer writing about it until I could come back with a charged camera to get this last photo. Finally, in that hopeful way of someone who doesn’t like the options they’re presented with and wishes the thing would just work, dammit, I flipped the on switch again. So I took the photo quick, before it could change its mind. And then I took ten more, of another, unrelated subject, figuring I might as well press my luck since I was out there anyway. And it was still on when I finally turned for home. Not precisely sure what happened with the battery, but maybe it knew I needed a good interlude here to keep you all in suspense. What?! We have to wait until tomorrow?! My guess is some sort of Ichneumon “nest tree”. Oh, I hope I’m right! ack! waiting for part two . seab, you tease! If there was an award for saying so much about so little, I’m sure you’d be in the running. Suggestion. Go to a mirror, look yourself in the eye, and ask if you are curious about nature, or just shallow.